Girina O.A., Senyukov S.L., Neal C.A. 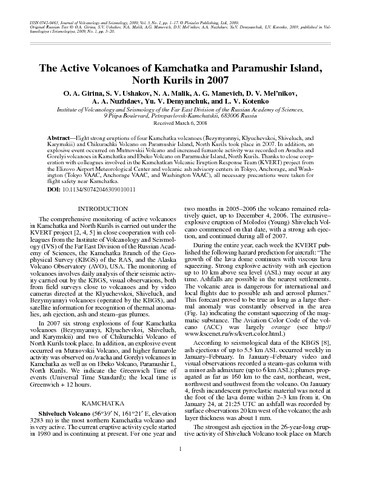 Kamchatkan Volcanic Eruption Response Team (KVERT) in 2002-2004 // 4rd International Biennial Workshop on Subduction Processes emphasizing the Japan-Kurile-Kamchatka-Aleutian Arcs, Petropavlovsk-Kamchatsky, August 21-27, 2004. Petropavlovsk-Kamchatsky: IVS FED RAS. 2004. P. 32-33. Goltz A.E., Krawczynsky M.J., Gavrilenko M.G, Gorbach N.V., Ruprecht Ph. 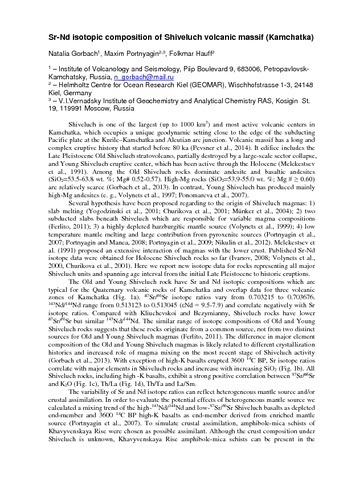 Petrology and geochemistry of mafic enclaves from Shiveluch volcano, Kamchatka // Goldschmidt2018 Abstract. Boston, USA: 2018. 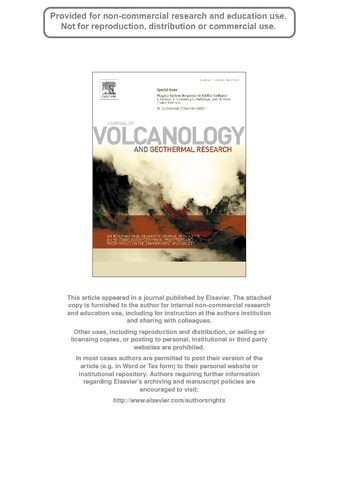 This paper presents the results from a study of ash compositions that were erupted in 2013–2016. The juvenile component has been identified in the ejecta using data on the morphology and textural features of ash particles and the composition of volcanic glasses. 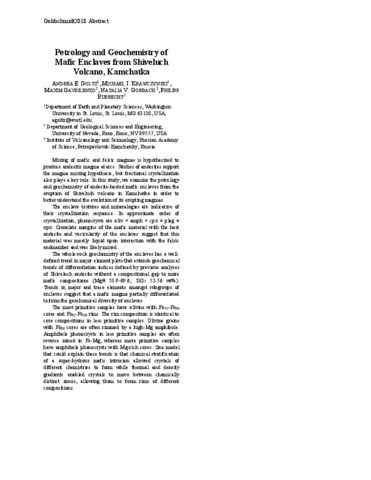 The data set suggests that the activity of the volcano was phreatomagmatic. Gorbach N.V., Ponomareva V.V., Pendea I. Florin, Portnyagin M.V. 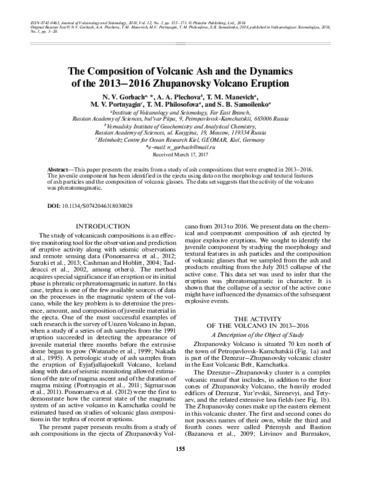 Small but important: new data about activity and composition of Zarechny volcano (Central Kamchatka depression) // 10th Biennual workshop on Japan-Kamchatka-Alaska subduction processes (JKASP-2018). Petropavlovsk-Kamchatsky, Russia, August 20-26. 2018. P. 83-85. Gorbach Natalia, Portnyagin Maxim, Hauff Folkmar Sr-Nd isotopic composition of Shiveluch volcanic massif, Kamchatka // 8-th Biennial Workshop on Japan-Kamchatka-Alaska Subduction Processes, JKASP 2014. 22-26 September, 2014, Sapporo, Japan. 2014. 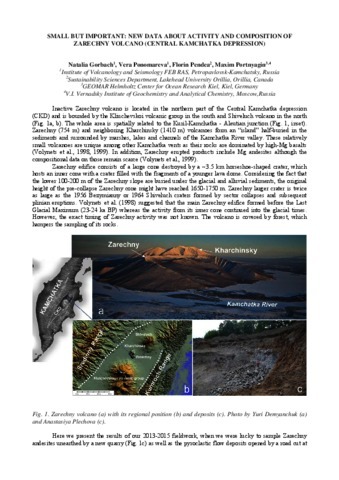 Gorbach Natalia, Portnyagin Maxim, Tembrel Igor Volcanic structure and composition of Old Shiveluch volcano, Kamchatka // Journal of Volcanology and Geothermal Research. 2013. V. 263. 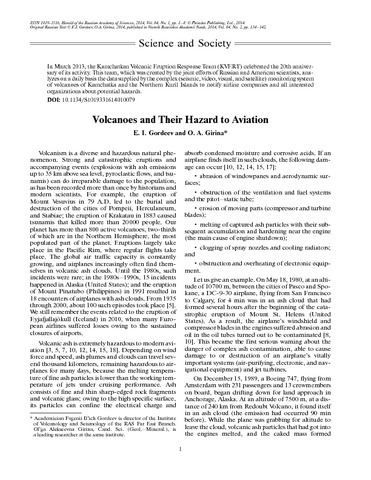 P. 193-208. doi:10.1016/j.jvolgeores.2012.12.012. In March 2013, the Kamchatkan Volcanic Eruption Response Team (KVERT) celebrated the 20th anniversary of its activity. 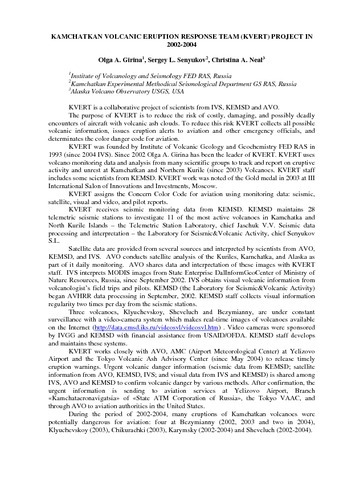 This team, which was created by the joint efforts of Russian and American scientists, analyzes on a daily basis the data supplied by the complex (seismic, video, visual, and satellite) monitoring system of volcanoes of Kamchatka and the Northern Kuril Islands to notify airline companies and all interested organizations about potential hazards.